"This simple, earthy, rich, and satisfying soup is easy to make in your Instant Pot® or electric pressure cooker. This recipe uses pork and hominy along with spices and herbs. Feel free to adjust the ingredients to suit your taste. Serve in bowls and add your favorite toppings, such as sliced radishes, shredded cabbage, diced avocado, chopped cilantro, lime wedges, and sliced jalapenos." Turn on a multi-functional pressure cooker (such as Instant Pot(R)) and select Saute function. Heat olive oil in the pot. Combine pork cubes, onion, garlic, chili powder, garlic salt, oregano, pepper, chipotle powder, and cumin in a bowl. Saute in the hot oil in small batches until pork is browned, about 5 minutes per batch. Turn off the pressure cooker. Add chicken broth, enchilada sauce, green chiles, and cilantro. Stir to blend. Close and lock the lid. Set cooker on high pressure according to manufacturer's instructions; set timer for 20 minutes. Allow 10 to 15 minutes for pressure to build. Release pressure using the natural-release method according to manufacturer's instructions, 10 to 40 minutes. Unlock the lid and add hominy, stirring to blend. 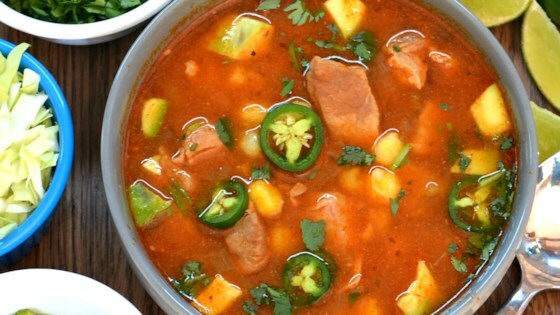 See how to make a traditional Mexican posole in your slow cooker. Use mild, medium, or hot green chiles, as desired. I made this just the way the recipe said, and it was delicious! I will be making this again! Recipe sounds good, but you might want to change the recipe to note that if you are cooking the meat in batches, you need to return the meat to the pot before adding all the liquid and cooking.